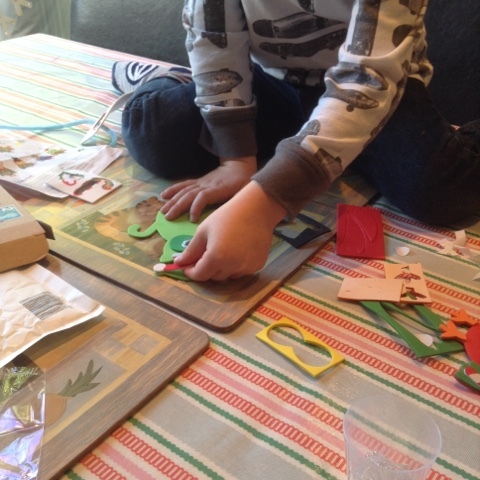 I love Baker Ross products, I know I get a bit gushy, but they really are so great for kids. 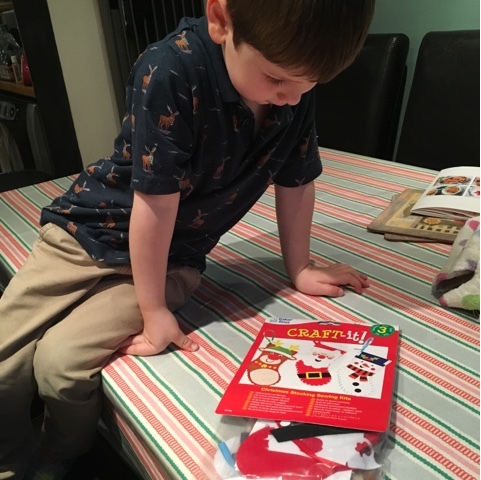 T is almost 4 and he can't wait to open his Baker Ross bloggers pack and get stuck in making when it arrives. Our Christmas review box, certainly didn't disappoint! There's still plenty of time to order for Christmas and many items are discounted! 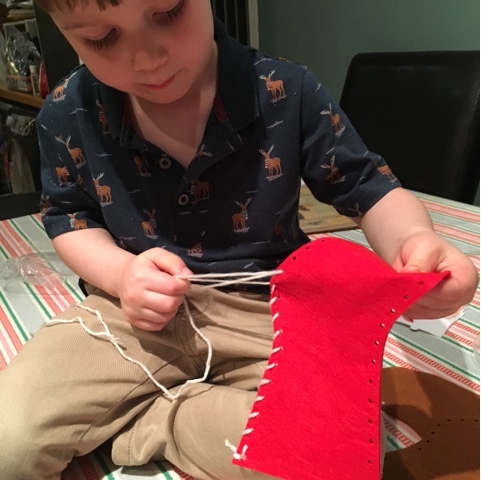 T picked out the Christmas stocking sewing kit £2.49 for 3 for his first activity, I was a little dubious as he's not the most patient boy and I thought the sewing might be too much for him but we gave it a go! 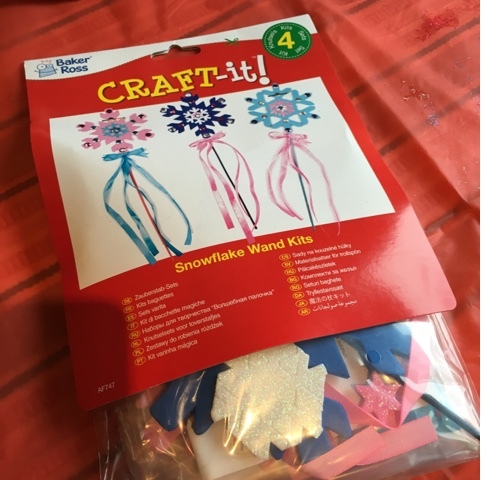 Each kit contains a plastic needle, with a rounded end it is perfect for this project and just right for little hands, I love that it can be used again too. Each kit comes with one so if you have more children they don't have to wait in turn for it! He did really well with the sewing, watching how I did it first to start him off, then copying himself. 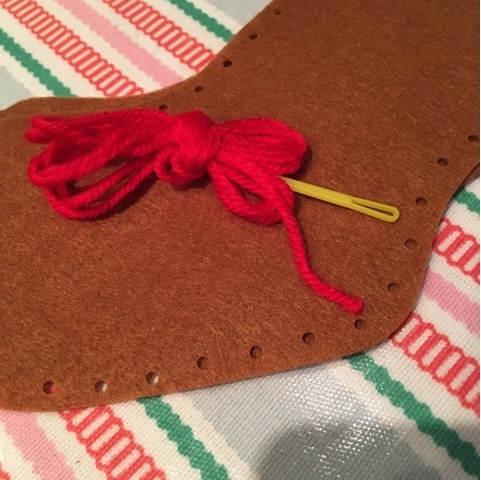 The clean holes in the felt and his 'special needle' made this activity really enjoyable for him and felt very grown up being able to do it himself! 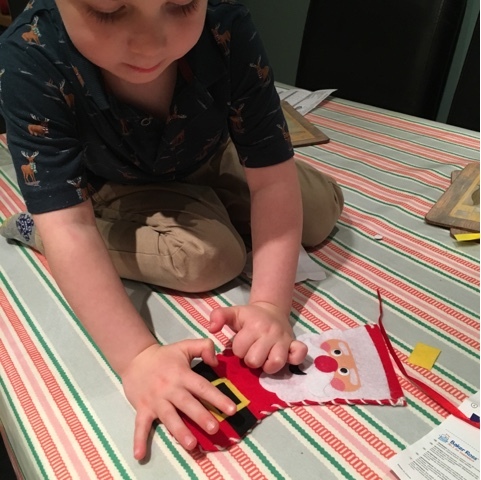 The felt details come in the form of stickers which make finishing off the stocking nice and easy, perfect for little hands. 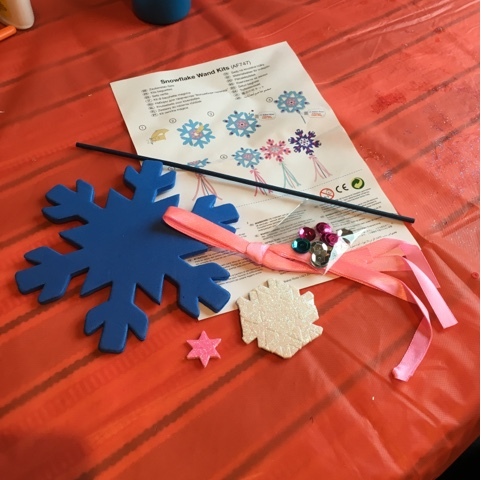 Our Snowflake wand kits £3.49 for 3 we all made together, I love a good old family crafting session and Daddy enjoyed these al,oat as much as T, although we didn't add the wands as we have stuck them on the patio windows, where they look super effective! 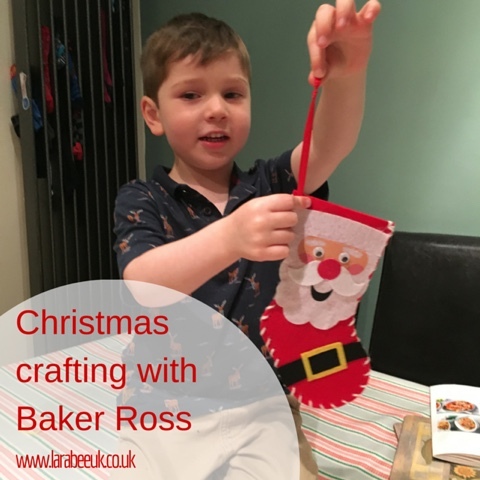 In true Baker Ross style everything you may need is included in each individual pack, with the exception of glue, this makes them perfect for taking away with you, doing in the car when travelling for Christmas or for passing a bit of time before Christmas dinner! 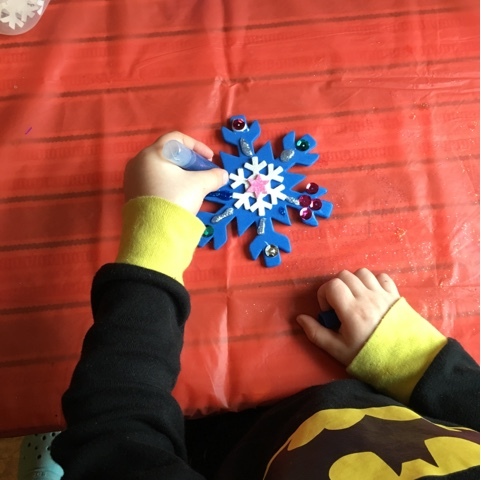 T customised his snowflake with a bit of glitter glue, he's definitely not a 'less is more' kind of boy! 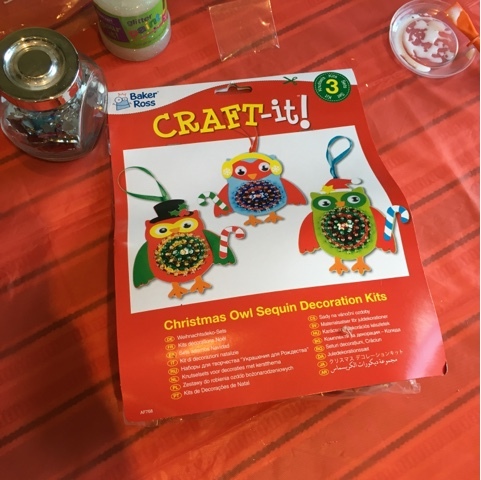 My favourite kit in the Christmas box were these fab Christmas owl sequin decoration kits £3.99 for 3 containing tiny plastic pins to attach the sequins T and I had lots of fun putting these together. 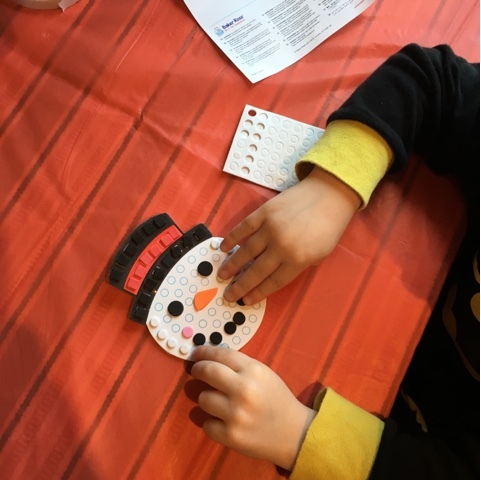 He really enjoys sticking on the foam stickers to complete the characters and is getting pretty good at lining them up nicely now. 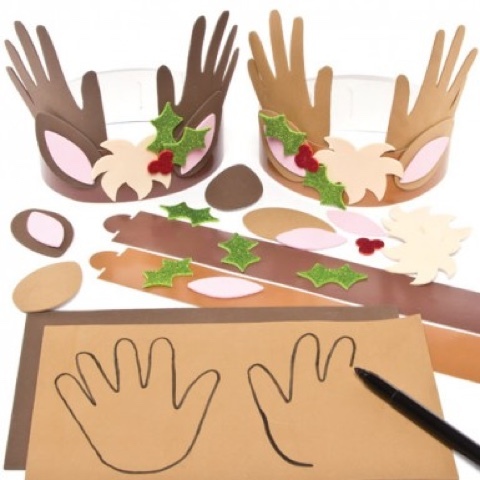 The Reindeer handprint antler crown kits are now selling for £2.49 for 4 and T loved these, he even made up little packs for his 3 best buddies so they could have one on Christmas Day too! T has stashed his away ready to bring out for Christmas dinner apparently! Who doesn't love a Pom Pom? 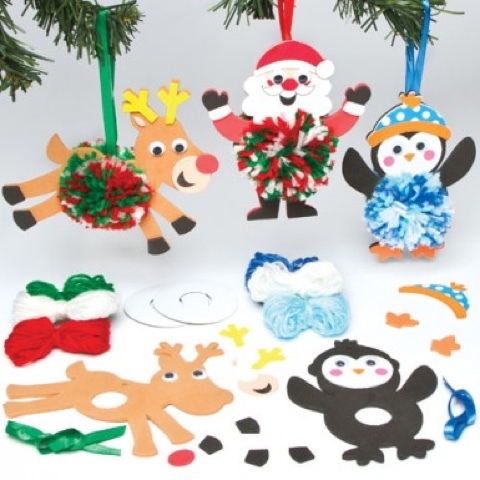 These Christmas Pom Pom decoration kits £3.60 for 3 were in our kit, but as T can't yet make Pom poms, we've not got round to doing them. 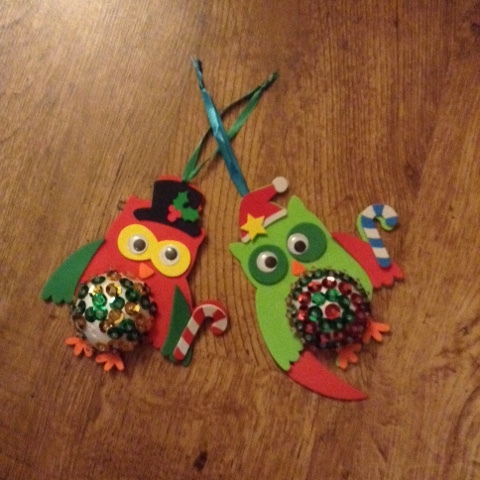 They are so cute though, i particularly like the reindeer and T likes the Santa, he's going to be putting these on his tree in his room. 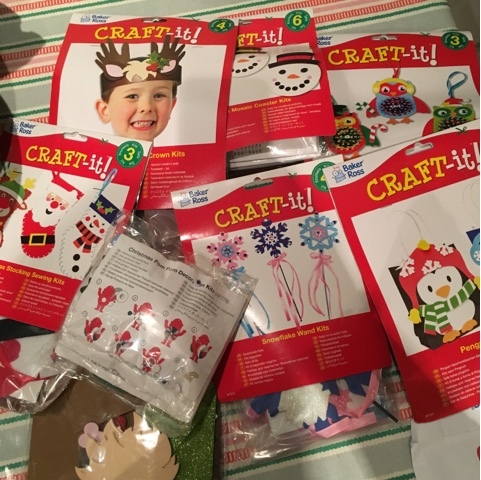 Remember there's still time to order your packs for Christmas, they make great stocking fillers, boredom busters or a great travelling activity if you are on the road this Christmas. DISCLAIMER: we were sent this box of kits to review as Baker Ross bloggers, all words and opinions are our own.